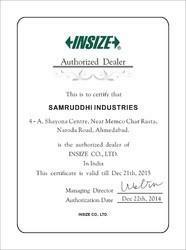 Established in the year 2005, Samruddhi Industries, is one of the prominent manufacturers and exporters of a comprehensive range of Industrial Testing and Inspection Instrument across the globe. We make use of high grade raw material to design and develop our complete product range to make it in compliance with the industry standards. These instrument are widely acclaimed for optimum performance and yielding accurate result and our product range includes testing instrument, industrial testing instruments, inspection instrument, plain gauges, universal welding gauge, ultrasonic gauge, thread gauges, dye penetration material, dye penetrant testing and radiography film viewer. Besides manufacturing, we are also involved in the trading and importing of this world-class range of instrument that are widely appreciated by our clients. These are sourced from reputed manufacturing companies to who make use of advanced technology in their production process. Moreover, we are bestowed with a state-of-the-art manufacturing unit that is well-equipped with advanced machines and equipment that enables us to manufacture a flawless range of instrument. We constantly strive to offer quality to our customers and thus our entire range is tested on various quality parameters such as accuracy, reliability, performance, operation and precision. Furthermore, we also provide calibration certificate and repairing of NDT equipment and measuring instrument traceability by NABL. Progressing under the able guidance of our founder, Mr. Parag D. Patel, we have been able to carve a niche in the industry. His immense industry experience and technical knowledge have been instrumental in guiding our company towards success and growth. Since our establishment, we are engaged in manufacturing a wide range of testing instrument, industrial testing instruments, inspection instrument, plain gauges, universal welding gauge, ultrasonic gauge, thread gauges, dye penetration material, dye penetrant testing and radiography film viewer. Our complete range is manufactured utilizing high grade raw material that is sourced from reliable vendors to ensure the quality of the end product. With the support of the exceptional skills and in-depth knowledge of our team of experts, we have been able to manufacture our range that is in compliance with the industry set standards. Our offered instrument is extensively used in various industries such as automotive, pharmaceutical along with foundries and laboratories. Moreover, to meet the varied requirements of our clients, these can also be customized as per the specifications laid out by them. We are backed by a team of qualified and talented personnel that allows us to offer a wide range of industrial testing and inspection instrument as per the international standards. With the help of our dexterous team, we have succeeded in manufacturing and exporting the instruments across the globe. They have sound industry experience and expertise in the domain that helps them to carry out any task assigned to them proficiently and meets the set target within stipulated time frame. Moreover, to ensure that only flawless range is delivered to the clients’ end, it under go stringent quality control tests at the every stage of production procedure by our qualified quality controllers. Well versed with market dynamics, our team of sales and marketing personnel helps to respond various product related queries of our clients.